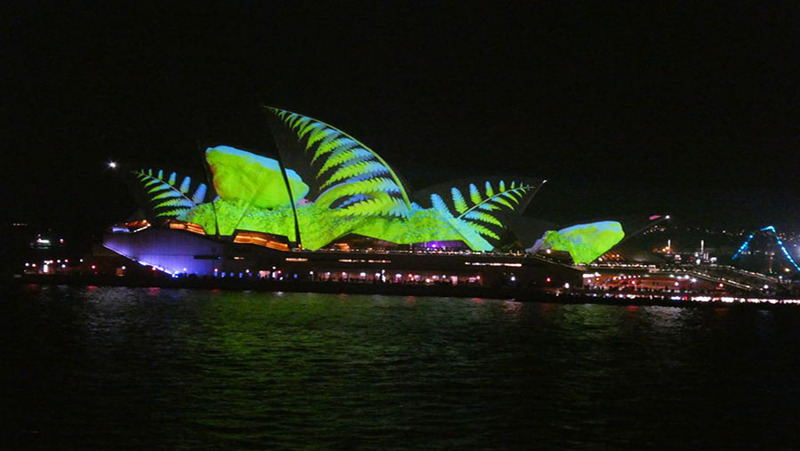 Vivid is a spectacular event that is a must-see for anyone living in and around Sydney. Dana, a second-year William Blue Hospitality student, shares her top tips on getting the most out of Vivid. Vivid Sydney is an annual event that brightens up the Sydney Streets, each year is bigger and better than the year before. The event is viewable right from the doorsteps of our Campus in The Rocks, we are literally in the centre of the action! Here are my top tips to make the most of out the seasonal festival. Opera Bar Located in the heart of the harbour, Opera Bar is located on Macquarie St. known for their unique cocktail menu and picture-perfect views, Opera bar is the bar to be to see the gleaming Vivid lights. If Opera Bar doesn’t tickle your Vivid fancy, just across the water is Cruise Bar. Located in the Overseas Passenger Terminal, the bar thrives on their priceless harbour views. Sky Terrace is a rooftop bar that is open for the Vivid season. It is located in the Star casino and provides views of the Darling Harbour side of Vivid. The bar offers pop up food stalls and live DJ’s to help set the atmosphere. Although only open Friday to Sunday this is a unique Vivid view that’s worth seeing. For the best vantage point of Sydney harbour, use the Circular Quay lifts which are located towards the Opera House end of the train station. Use the glass lifts to be lifted to the light view from one of the most well-hidden lookouts in Sydney. Due to the secluded access location, many Vivid visitors don’t know it exists. Capture spectacular views of the Harbour Bridge and Opera House like you have never seen them before. During vivid, the city has lit up many of our favourite attractions such as Luna Park and Taronga Zoo so you can combine a fun family activity with the festival to make a memorable outing, no one will forget. Taronga Zoo located in the Sydney suburb of Mosman takes a different approach to the Vivid season by using the festival to raise money and awareness about animals in the wild and fighting their extinction. As this is a money raising event tickets must be prepurchased to ensure you don’t miss out. Tickets are available on the Taronga Zoo website and the concession price is $22. The Zoo is open for the display of the vivid lights each night from 5.30pm to 9.30pm. This is a worthy cause this Vivid season. A little closer to the CBD is Luna Park, which is brighter than ever before during the season of Vivid. Go to see the lights from on top of the Ferris wheel with a glass of bubbles and be part of the celebrations from above. Luna Park is open 6pm till 10pm during Vivid and tickets can be purchased starting at $25 which includes unlimited rides and a food voucher. Put a twist on your adventure this year and let the adrenaline rush. Vivid has an app that gives you the best walking route through all of the light installations and activities. The best feature on the app is the view that shows you the numbers of each installation and the best way to get to them.